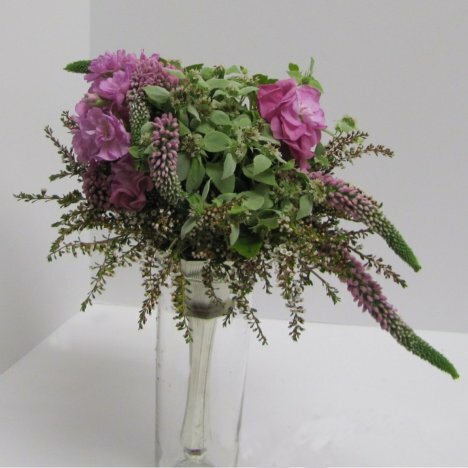 Bridesmaid bouquets can be designed to either compliment or match the attendant's dresses. 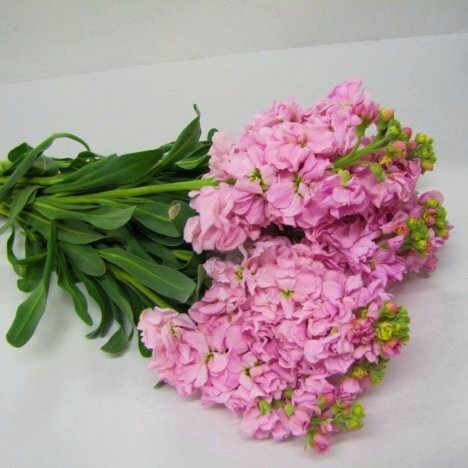 I do want to caution you that the color "pink" is a wide range of colors decided by the various growers. They can range from palest to a rather red violet color. 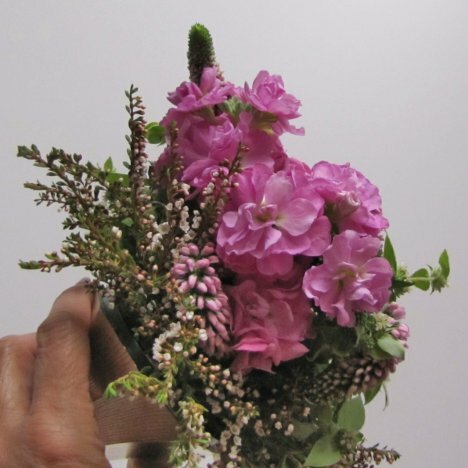 One variety that is a true crayon pink is stock flower. 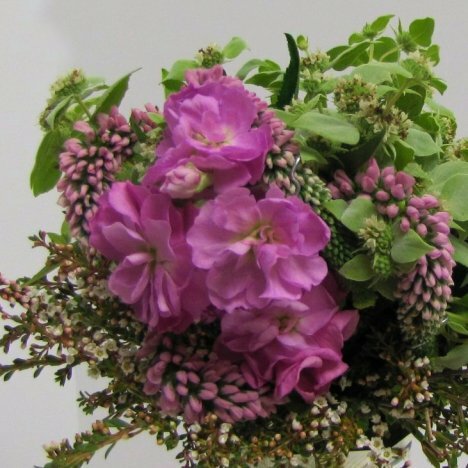 It is has a strong stock with luscious clusters of blooms traveling up the stalk. Stock will arrive looking rather mashed and tired looking - but will perk up quickly after cut under water and allowed to re-hydrate. 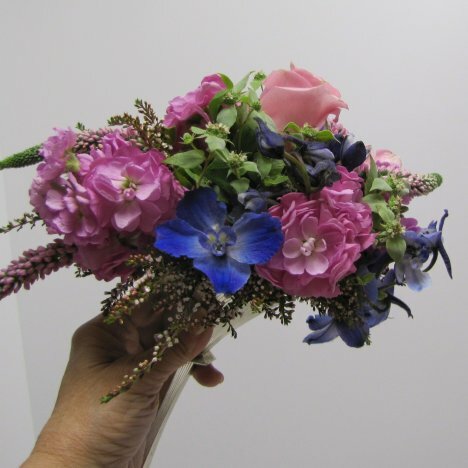 Stock can be cut into shorter stems and is sometimes mistaken for hydrangea. The advantage is that stock smells delicious and holds up much longer than hydrangea. 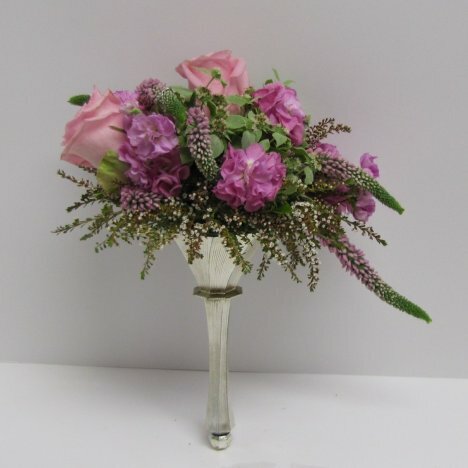 Continue to add more stock on the left side, filling in the bouquet. 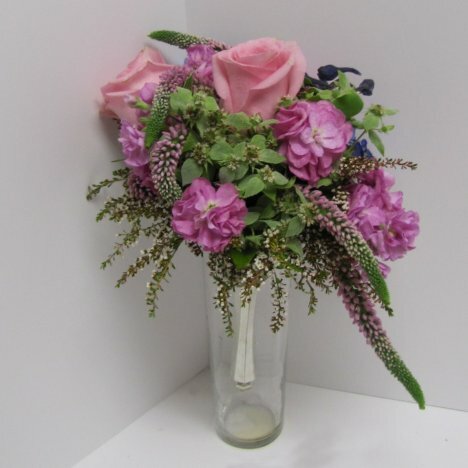 The bouquet is actually going to be a crescent shape down on the right side. 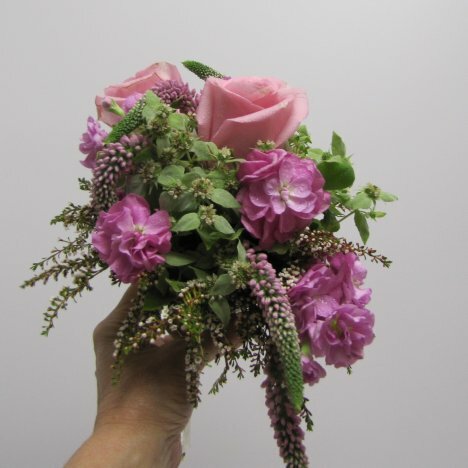 I'm going to now add a contrasting pink in these lovely tea roses. 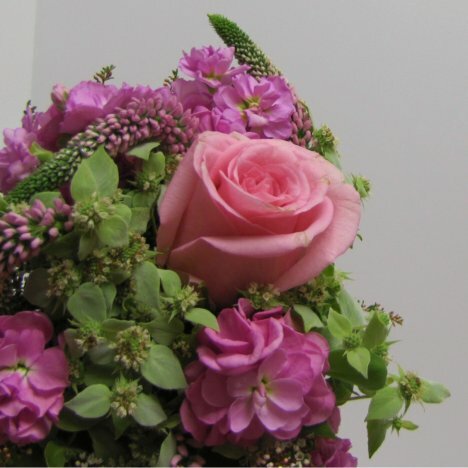 Place the rose in the upper right area of the bouquet. Place the second rose higher on the top left, facing towards the back. This is the position that the bouquet will be carried down the aisle, with the veronica swooping down on the lower right. 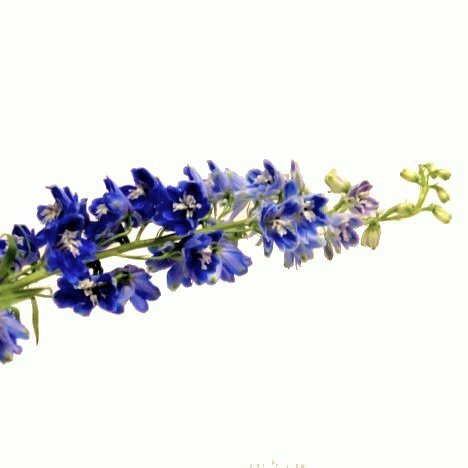 Let's add some dramatic color contrast with this gorgeous bright blue of delphinium. 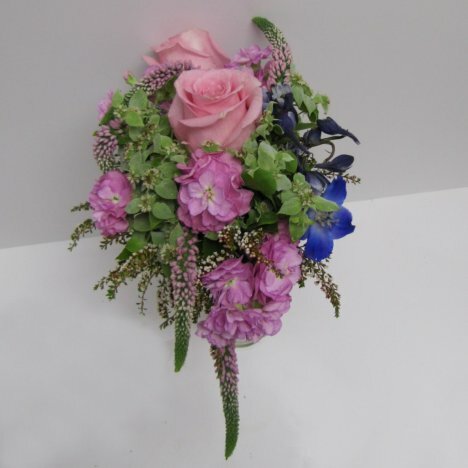 You can see the open area on the side of the bouquet that would be a perfect place to fill in with the blue delphinium. 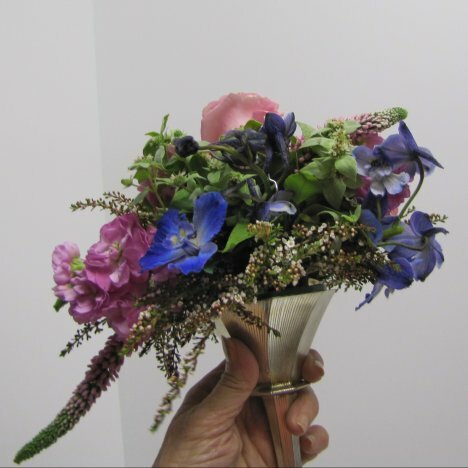 The single stalk of delphinium can be cut into several shorter pieces and inserted into those open areas in the bouquet. If you wish some more blue, add on the left side if you wish. 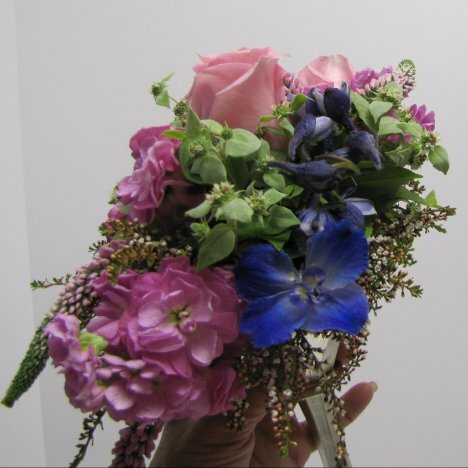 Rotate the bouquet around in your hand, looking for open spots that could be enhanced with more stems of delphinium. 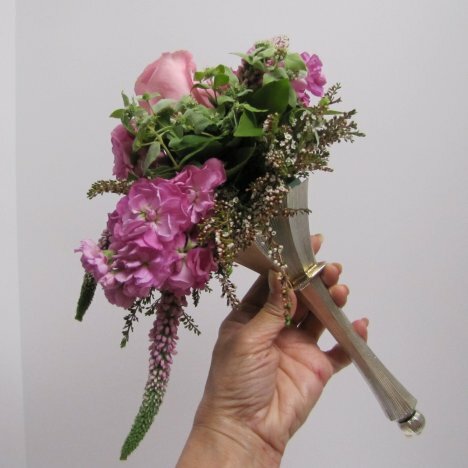 Even one single stock can be enough for small bridesmaid bouquets. The fun part of designing is that you can let your own creative inspirations come out.